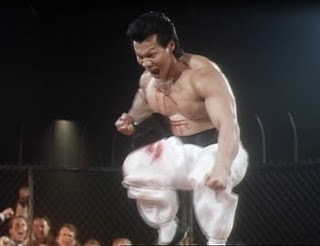 This opening quote sets the tone for this lively beat-em-up starring the ever-lovable Bolo Yeung as Shingo. The plot revolves around two buddies named Ruben and Nick played by Zabka and Bernardo respectively. Yeung plays their mentor. There is the prerequisite montage where he teaches them to "shootfight" and also they play basketball with young black children and Shingo smiles in an oddly fatherly way. Before the shootfighting tournament, there is a fight in a grocery store a la Cobra (1986) where Bolo shows off both his fighting and his broken English skills. You may remember Zabka as Johnny from The Karate Kid (1984) where he infamously swept his leg at Macchio. Apparently he couldn't get enough karate-chopping action, so he hooked up with director Patrick Allen to give birth to Allen's one and only cinematic baby. Ruben and Nick get embroiled in an underground "shootfighting" ring. They eventually have to shootfight each other...to the death, but not before battling an array of wacky baddies in the ring, such as "Boa", who acts like a snake (including the hisses) and Mongoose, who adopts a mongoose fighting style, whatever that means. Some fights have a surprising amount of gore (i.e. limbs and fingers being broken off in a bloody mess), and this provides unintentional laughter and it sustains the viewer's interest until the end. Martin Kove plays the evil mastermind, inexplicably named "Mr. Lee", who is behind all the shootfighting, and in his villainous rage, slices a pineapple with a samurai sword. What is "shootfighting" you ask? Well, that question is never quite answered satisfactorily, but after doing some research we were able to determine (by reading the back of the VHS box) that it is a "forbidden sport so brutal it's banned from the civilized world". Prepare to get uncivilized with this classic. I cant't believe I haven't seen this yet. BOLO, JOHNNY LAWRENCE and SENSEI JOHN KREESE in the same movie... It has to be great. The early 90s were truly a good time. I'm definitely going to watch this. Awesome! It is a blast. Make sure to track down the UNRATED version. It has all the gore and fights intact. The R-rated one is cut to shreds.